I met the guys from Triple Dog Dare Media at SXSW last year and liked their editor/writer-centric approach to WCMS development and functionality. We had an interesting talk ranting about how a WCMS implementation is not an IT project but more of a business process re-engineering project that should focus on the users - not create a priesthood of technical WCMS support staff. So I was excited to get a note from them about a new product they have aimed at very small business owner/operators who want to get control of their Web content. 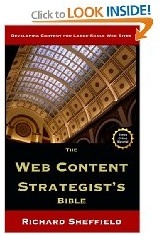 As a content strategist you will occasionally be asked for input regarding a WCMS solution. My experience is that companies tend to way over spend when it comes to a WCMS because the do treat it like an IT project, and IT projects are always expensive. If they thought about it more like adding a new productivity tool and looked for low-cost and open-source solution, they might come out with a better, and cheaper, solution. Called XippyCMS (think zippy), it sells for less that $400.00 and they claim you can be up and running in 15 minutes. It’s built on PHP 5, XML, and uses AJAX so hopefully the UI will be clean and quick. You can reskin XippyCMS with your own CSS files. You can upload files. Add events. Create pages and sidebars. You can even totally rewrite the AJAX behavior that powers the front end. All you need to get started is a hosting account on a Linux server with PHP 5 support (most hosts support this now as it’s needed for most blogs), and an FTP tool.